Hughes Hubbard’s D.C. office was among 33 firms honored by the federal judiciary for providing outstanding pro bono legal services in the local community last year. On April 21, 2016, the DC Circuit Judicial Conference Standing Committee on Pro Bono Legal Services held its 13th annual “40 at 50 Judicial Pro Bono Recognition Breakfast” in the lobby of Washington’s federal courthouse. The event honors firms where at least 40 percent of their attorneys performed 50 or more hours of pro bono services for the year. Hughes Hubbard was also recognized as one of 14 firms to have 50 percent or more lawyers contribute at least 50 hours of pro bono work. Hughes Hubbard was also recognized as one of six firms to have 40 percent of its partners perform at least 50 hours of pro bono work. Merrick Garland, chief judge of the US Court of Appeals who is a nominee for the US Supreme Court, praised the law firms that were honored, saying the lawyers’ commitment to public service in law were the same choices that had shaped his career. The breakfast garnered coverage in The National Law Journal. John Wood oversees the pro bono program in the DC office. 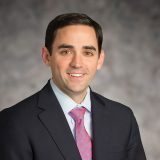 Michael DeBernardis represented the firm at the event.